What a great week we had last week in Indianapolis at the CASE executive committee, board of directors and the 24th fall conference! At the BOD meeting, we received great input from the BOD members on hot issues on such topics as ESEA & IDEA reauthorizations, assessment-both for teachers and administrators, transition and others. The conference kickoff was led by a great keynote from CEC president, Dr. Christy Chambers on the importance of leading by head, hands and heart! Dr. Deb Ziegler, CEC policy and advocacy associate executive director, gave a detailed update on what is happening in D.C. Julie Weatherly, esq who has authored several CASE Lucky 21 monographs, gave a detailed keynote of major legal issues facing SPED administrators. Our Saturday keynote was Dr. Frances Stetson, one of the most knowledgeable, practical and energetic speakers ever. Dr. Stetson not only gave an inspirational and practical keynote, she also provided a downloadable tool box for the participants! There were a great variety of practical, quality breakout sessions, including the 8 Cracker Barrel sessions which were designed to get participant input of some very timely topics. One of the questions each group answered for the topic was "what should CASE be doing about this?" If you missed this amazing professional development opportunity, mark your calendar for the 25th annual CASE conference in San Antonio on Nov. 15-17, 2014! P.S. 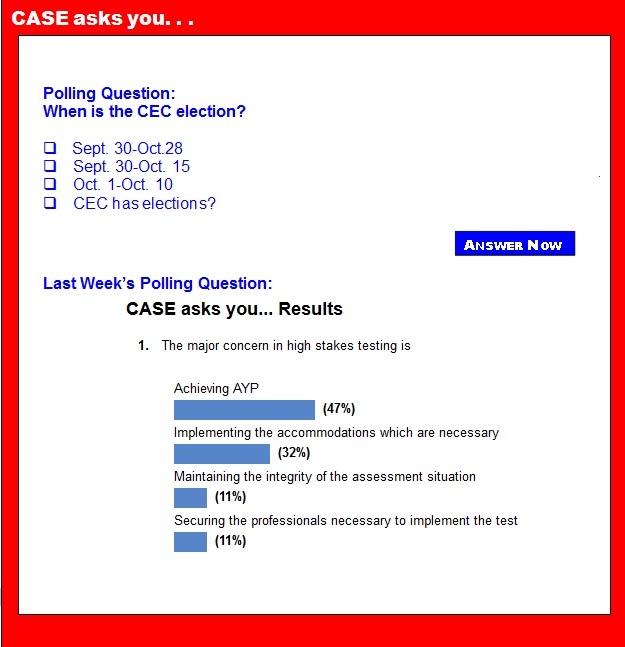 If you are a CEC/CASE member, you should be receiving an electronic ballot in your email today or tomorrow — Please vote as soon as you can between Sept. and Oct. 28! Academy of MATH® is an intensive, online intervention program for students struggling with math. This dynamic program uses systematic instruction that begins with simple concepts and moves to more complex skills. Watch this video to learn why this CASE-endorsed math program is so effective with struggling students. It's mid-September and children are back in the classroom. What better time to equip parents with the information they need to know about education data and their child's success? The Data Quality Campaign teamed up with the National PTA to create What Every Parent Should Be Asking about Education Data and Privacy, which provides parents the questions they should be asking their children's educators about the value of education data and how student privacy is ensured. Please share these privacy resources with your networks, and contact DQC with any questions. Were happy to provide whatever support we can around these issues. With new reforms in education taking hold across the country, the U.S. Department of Education is seeking to improve the quality of special education data collected under the Individuals with Disabilities Education Act. Recently, the U.S. Department of Education announced it will award $14 million to three types of centers focused on providing assistance to families of children with disabilities. One Center for Parent Information and Resources, six Regional Parent Technical Assistance Centers; and one Native American Parent Technical Assistance Center will receive this funding which will enable improved information for parents on important laws, policies and evidence based education practices that affect children with disabilities. On Sept. 20, the U.S. Department of Education awarded a grant of $200,000 to Southern University in Baton Rouge, Louisiana to conduct research on ways support African-Americans with disabilities transition into society successfully. As e-readers grow in popularity as convenient alternatives to traditional books, researchers at the Smithsonian have found that convenience may not be their only benefit. The team discovered that when e-readers are set up to display only a few words per line, some people with dyslexia can read more easily, quickly and with greater comprehension. The Partnership for Assessment of Readiness for College and Careers, a 19-state consortium working together to create next generation assessments, additional sample items for both English language arts/literacy and mathematics. Researchers aren't sure why, but over the past several years, the number of children reported to have allergies has doubled, to 5 percent of children in the United States. Yet at the same time, in schools and elsewhere, allergies have drawn what some see as an oversized amount of attention. Dyslexia really a form of creative genius? Imagine yourself at the back of a classroom on your first day of school. The scene painted before you is full of colors, faces and imagery dancing in tides of letters on the wall and voices from the hall. It seems so magical, mystical even, the way the walls come together to meet the floor, splaying out into a colored array of children's costume cloaks and pencils squared by rectangular sheets of white paper. The picture is beautiful. You can almost hear the music coming out of the bricks, aware of how many times the carpenter placed hands to the wall in order to construct such a meeting space. Then the teacher writes three letters next to one another on the black board and speaks the word they supposedly make. The artistic scene crumbles from around your eyes as the teacher calls your name and asks you to read the next three letters written, for they hold no meaning and no charm. Could this be your child? Is dyslexia really a form of creative genius? September ushers in autumn, back-to-school, and National Yoga Month. Designated by the Department of Health & Human Services, National Yoga Month features yoga's numerous health benefits. Now research reports that yoga may help relieve attention-deficit hyperactivity disorder in children. ADHD is one of the most common childhood behavioral disorders. According to the U.S. Centers for Disease Control and Prevention, 8.4 percent of American children are diagnosed with ADHD. A seminar that encouraged counselors to alter the stigma of mental illness at their schools assumed a special urgency as a rash of shootings, most recently at the Washington Navy Yard, focuses the nation's attention on mental health. More than 100 elementary school counselors in the Palm Beach County School District learned a new curriculum aimed at fourth- and fifth-graders called "Breaking The Silence: Teaching the Next Generation About Mental Illness." A new $1.4 million federal grant will fund the establishment of a Center on Technology and Disability. The goal of the award is to help children with disabilities, their families, and their schools to access and use assistive technology to improve learning outcomes. The grant, administered by the United States Department of Education's Office of Special Education and Rehabilitative Services, was funded through the Technology and Media Services for Individuals with Disabilities program, authorized under the Individuals with Disabilities Education Act. It was awarded to Family Health International, which will operate the center along with American Institutes for Research and PACER Center. Forty-five states have adopted the Common Core State Standards, the first-ever national academic standards for students. But opposition is growing, and some lawmakers are having second thoughts about their states' support. Meanwhile, proponents of the standards are still struggling to explain the initiative to parents, many of whom say they've never even heard of the Common Core. Public schools around the United States are still waiting to feel the recovery from an economic recession that officially ended four years ago, mostly because states have kept education spending low and property taxes remain depressed, according to a report. At least 34 states are providing less funding per student in the current school year than before the recession hit. Moreover, at least 15 have lower funding than a year ago, according to the liberal-leaning Center on Budget and Policy Priorities, which closely tracks state spending. As e-readers grow in popularity as convenient alternatives to traditional books, researchers at the Smithsonian have found that convenience may not be their only benefit. The team discovered that when e-readers are set up to display only a few words per line, some people with dyslexia can read more easily, quickly and with greater comprehension. Their findings are published in the Sept. 18 issue of the journal PLOS ONE. Kristin Whitsel slips Slowdown Snail onto her hand and asks her kindergarten class why he's there. Without hesitation, a little girl answers that the puppet reminds them to slow down and not be so bouncy and talkative. Whitsel nods her head in agreement. "He reminds us to slow down and think, think, think about how we treat others," Whitsel said. In another wing at Sioux City's Spalding Park Elementary School, Tina Buhrman teaches her fifth-graders about supportive behavior through a scenario in which an aunt's playful teasing embarrasses her nephew in front of his friends. She shows her class a picture of a young boy placing a comforting hand on his friend's shoulder. The Institute of Physics has produced a practical guide to supporting Science, Engineering, Technology and Mathematics students with dyslexia — thought to be about 5 percent of all STEM students in higher education. It aims to show how dyslexia affects students in STEM and describes some simple measures for making teaching and learning more accessible.